Quote: Facebook explains it can comb through its 2 billion users and produce millions “at risk” of jumping ship from one brand to a competitor. Quote: The vast majority of data that Facebook knows about you is because you chose to share it. Right? It’s not tracking. There are other internet companies or data brokers or folks that might try to track and sell data, but we don’t buy and sell. … For some reason, we haven’t been able to kick this notion for years that people think we will sell data to advertisers. We don’t. That’s not been a thing that we do. Actually it just goes counter to our own incentives. Even if we wanted to do that, it just wouldn’t make sense to do that. Quote: You can think of Facebook as having protective surveillance [over] how competitors are going to try to draw customers. … We can surveil for you and see when your rival is tying to pick off someone, [then] we’re going to swoop in and make sure they’re kept in your camp. That Facebook is offering to sell its ability to predict your actions — and your loyalty — has new gravity in the wake of the 2016 election, in which Trump’s digital team used Facebook targeting to historic effect. Facebook works regularly with political campaigns around the world and boasts of its ability to influence turnout — a Facebook “success story” about its work with the Scottish National Party describes the collaboration as “triggering a landslide.” Since Zuckerberg infamously dismissed the claim that Facebook has the ability to influence elections, an ability Facebook itself has advertised, the company has been struggling to clean up its act. Until it reckons with its power to influence based on what it knows about people, should Facebook really be expanding into influencing people based on what it can predict about them? 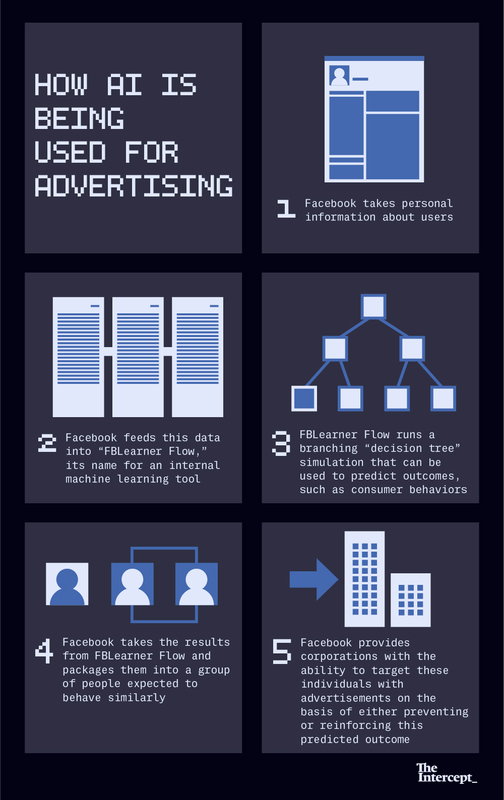 Facebook denied that FBLearner Flow is used for marketing applications (a “mischaracterization”) and said that it has “made it clear publicly that we use machine learning for ads,” pointing to the 2017 Wired article.